Who exactly are the Fulani, and why are they accused of wreaking such havoc in Nigeria? Boko Haram recently made headlines when it kidnapped 109 girls from the north-eastern town of Dapchi, in an attack reminiscent of the 2014 Chibok abductions. This Dapchi raid was however carried out by a different faction, and all the girls but one were soon returned. This is a reminder that Buhari has had some counter-terrorism successes. Boko Haram has been pushed out of territory it previously controlled, especially in Borno State, and is weaker than under former president Goodluck Jonathan’s watch. Then there’s Buhari’s own health problems, which have seen him spend months of his presidency on sick leave in London. In 2018 he has spent much less time at the doctor, but his health remains a hot political issue, especially for opposition parties. After his medical sojourn earlier this month, the opposition People’s Democratic Party described him as ‘unwell, ailing and unfit to attend to state matters’. So far, Buhari’s government has been slow to respond, with the Fulani issue receiving far less attention and resources than Boko Haram. Critics suggest that this is because Buhari is himself a Fulani, and is therefore unwilling to clamp down on members of his own ethnic group. 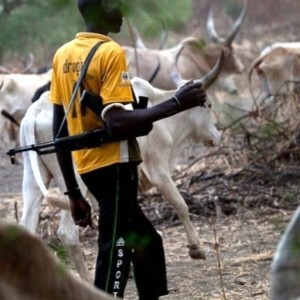 As Africa Confidential writes: ‘The herdsman-farmer clashes, with both sides forming well-armed ‘self-defence’ militias, (have) become the dominant security issue in the country. In reality, it is one element of a wider problem of rampant criminality, either ignored or encouraged by local politicians. Another neglected factor in this complex problem is climate change, which is permanently reconfiguring the landscape of northern Nigeria. Chiagozie Udeh, a climate change policy analyst, writes in Ecologist that the government’s response ‘has ignored climate change as the source of conflict exacerbating the herdsmen’s grazing crisis’. ‘Historically, since the existence of Nigeria, the Fulani herdsmen have grazed their herds in the north and intermittently in other areas. But incremental drought with resultant desert encroachment forced them to regularly look southwards for greener grazing areas,’ he says. Udeh argues that Nigeria must prioritise efforts to mitigate the worst effects of climate change, such as with the Great Green Wall, a reforestation initiative designed to prevent the Sahel desert from creeping further south. The country should also use its diplomatic clout to be more active on the international stage. ‘It is distressing that Nigeria is not yet a member of the Climate Vulnerable Forum (CVF) – a 43-nation group of most vulnerable countries that negotiate as a bloc at the United Nations Framework Convention on Climate Change (UNFCCC). It speaks to the lethargy that characterises such issues of great importance,’ says Udeh.